Measure fNIRS in high-density set-ups, from anywhere on the head, concurrently with (nearly) any other modality. Monitor your subjects via Wi-Fi while direct-to-device system recording ensures data is always stored, or choose higher-bandwidth USB connectivity for applications in BCI and neurofeedback research paradigms that require ultra-high performance processing. NIRSport 2 integrates seamlessly with EEG, fMRI, eye-tracking, cochlear implants, TMS, tDCS, EMG, pulse oximetry, and other modalities. Request a quote or get more information on NIRSport2. 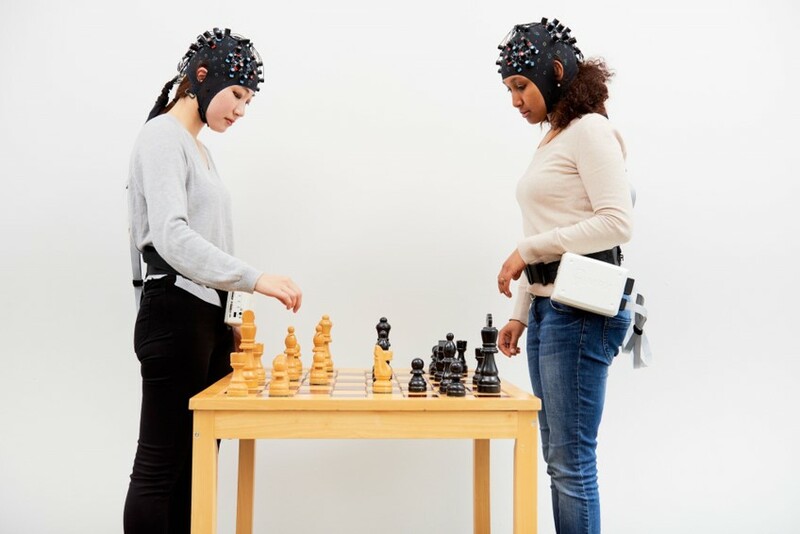 Join a worldwide team of researchers continuously expanding the possibilities of fNIRS. The NIRSport 2 is a user-friendly, modular, and robust wireless functional near-infrared spectroscopy (fNIRS) platform which measures hemodynamic responses to neuroactivation via oxy-, deoxy-, and total hemoglobin changes in the cerebral cortex. The NIRSport 2 comes with a host of ready-to-implement upgrades and modules to meet the needs of a broad range of cognitive neuroscience applications. Optimize your NIRport 2 system with the precise configuration for your research. The NIRSport 2 comes together with Aurora fNIRS: a new software platform designed to maximize user-friendliness, flexibility and intuitive workflow. In just a few clicks, Aurora fNIRS allows you to set-up a complete experimental configuration. The automated signal optimization algorithm ensures optimal signal quality before a measurement is started. Once data is being recorded, HbO and Hb concentration changes can be visualized in real-time in several display modes. In addition, high-end whole-head visualizations are immediately available. Aurora fNIRS is developed exclusively for the NIRx NIRSport 2. Learn more about Aurora fNIRS. The back of the NIRSport 2 with USB mini port for hard-line data collection for high-bandwidth, rapid-sampling requirements (e.g., BCI, neurofeedback). The battery may be wall-powered during recording and LED indicators give visual feedback on battery levels on the system itself for computer-free measurements (battery levels are also shown in the recording software for hard-line or wireless recording using the Aurora fNIRS software). The front of NIRSport 2 with hard-line TTL event trigger port (top), allowing for ~0ms latency event triggers. Wireless triggers are also allowed, so users have flexibility in their event design. 2x source ports (left side) each allow 8 sources to connect (16 total), 2x detector ports (right side) each allow 8 detectors to connect (16 total). Side 1 of the NIRSport 2 shows the heat-dissipation (“head sink) bottom metal plate, which allows for maximizing the source and detector power and sustained performance, even in very warm outdoor conditions. Side 2 of the NIRSport 2 shows one of its heat-dissipation vents (additional vent on bottom) which further improves system performance. The NIRSport 2 may be ‘daisy chained’ to connect multiple systems together in tandem-cascading configuration. 2, 3 or 4 systems may interconnect in tandem-cascading mode; in each case, all data and event trigger information is fully-synchronized between NIRSport 2 devices. Event triggers may be sent wirelessly or hard-lined through the trigger port (parallel port adapter included - option to use BNC spitter input) directly to the NIRSport system. The back of NIRSport 2 with cascading ports (extension A and B) to link multiple NIRSport amplifiers together for extending source/detector number and channel count. Right: NIRScap integration with passive EEG electrodes and NIRSport 2 NIRS 'optodes' (i.e., NIRS source and detector probes). 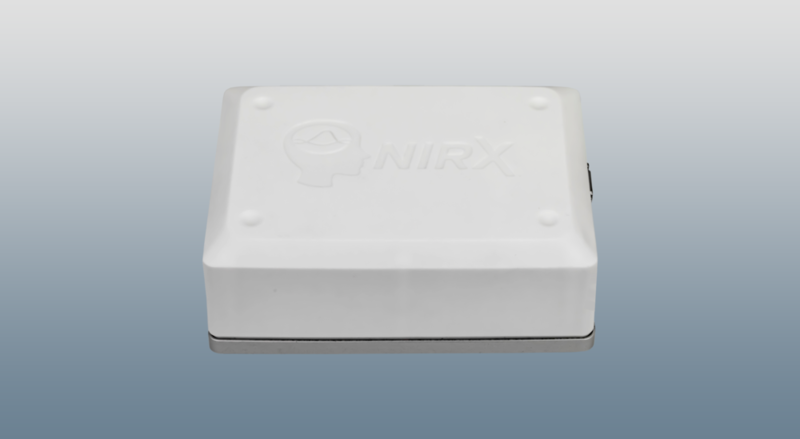 NIRx can easily integrate with nearly any EEG electrode for concurrent NIRS/EEG measurements. Integration with passive unshielded, passive shielded, active, and sponge electrode solutions all exist for NIRSport 2 and NIRScap. Data integration with NIRSport 2 and EEG systems is easy with event synchronization. This may be done at the start and end of experiments, during 'trigger' events, or arbitrarily during the experiment. Request a quote or get more information on NIRSport 2. NIRSport 2 with back strap for mobile applications: the system weighs only ~800g. Keeping the amplifier on the back, rather than mounting it to the head cap, leaves the head and neck free to move in a naturalistic way.